Emmanuel Sanders nearly signed with the Patriots in 2013, and they would have been dangerous if he had. In 2013, the New England Patriots almost lost Julian Edelman to the New York Giants after Tom Coughlin and the organization had him in for a visit. In the same offseason, the Patriots nearly brought in another talented receiver for Tom Brady to throw to. 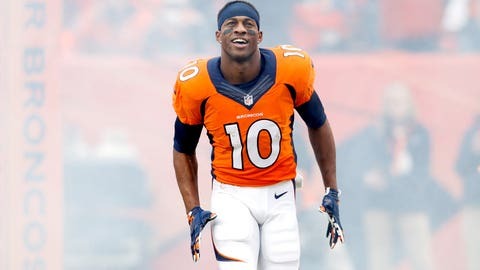 Emmanuel Sanders was a restricted free agent with the Pittsburgh Steelers, but he agreed to a one-year, $2.5 million offer sheet with the Patriots. The Steelers matched the Patriots’ offer, holding onto him for another season. Had Sanders ended up in New England, he believes they would have won multiple rings together. The Patriots, of course, held onto Edelman, but having him and Sanders on the field at the same time could have been deadly. Contrary to belief due to his smaller stature, Sanders wasn’t a "slot receiver" at the time. In 2013, he ran just 14.3 percent of his routes out of the slot, according to Mile High Report. Following the 2013 season, Sanders signed with the Denver Broncos. In the two seasons since then, he’s caught 177 passes for 2,539 yards and 15 touchdowns. Needless to say, he would have been a beneficial addition to the Patriots.